Because there are so many Instant Pot models to choose from, looking through the company website can make even the most seasoned cook’s head spin. We’ve spent at least 5,000 hours testing more than 60 kitchen gadgets ranging from sous vide machines to multifunctional pressure cookers like Instant Pots. Based on our testing and research, our pick for the best Instant Pot is the Duo80. The 8-quart Instant Pot Duo offers user-friendly features and perks without breaking the bank. In addition to the Instant Pot Duo80, other Instant Pot models have a lot to offer. We’ve also included our picks for the best Instant Pot for a single person or couple, the best Instant Pot for a beginner, the best Instant Pot for a family or four, and the best Instant Pot for a larger family. Who should buy this? Beginners or experienced pressure cookers who want a device that can pressure cook, slow cook, saute and more. Who’s it for? Anyone who wants to make fast and easy meals. When people think “Instant Pot,” this is the model that comes to mind for most people. The 8-quart Instant Pot Duo stands out for its features and affordable price point. This is not to say other Instant Pot models aren’t solid devices, because many other Instant Pots are excellent multifunctional pressure cookers. However, the Duo strikes a perfect balance between affordability and the features offered. The Instant Pot Duo is the number-one selling multi-cooker, and it combines a rice cooker, pressure cooker, slow cooker, steamer, yogurt maker, and warmer into one convenient package. It boasts a variety of user-friendly features, ranging from a slot on the handle to place the lid to a steaming rack with handles so you can easily remove it from the pot. You can fit a lot of ingredients in the 8-quart Duo too. You can easily fit a whole chicken into this Instant Pot, you can brown three or four pounds of frozen ground beef, or you can cook a large roast. If you like making stews, this pot can hold enough to feed eight to 12 people. For dessert lovers, the 8-quart Duo can easily fit an 8-inch springform pan and some 9-inch round pans. Who should buy this? Single people or couples who want a reliable pressure cooking device. Who’s it for? Small households who want to save money on takeout and cook more meals at home. For single people, roommates looking to save cash on takeout, or couples looking to cut down on cooking time, the Instant Pot Duo Mini is a great place to start. The small size also makes it an ideal option for college dorm rooms, camping trips, and even boating excursions. But you can still cook a decent amount of food in this appliance. Soup, stew, broth, yogurt, risotto, potato dishes, and fall-off-the-bone meals are all fair game, albeit in smaller doses. For reference, it can handle up to six cups of uncooked rice (that’s 12 cups cooked). You’ll receive a bundle of accessories with your pressure cooker, including a rice measuring cup, stainless steel steam rack, soup spoon, and recipe booklet. If you want a larger version of the Instant Pot Duo, it also comes in 6-quarts (retails for $100) and 8-quarts (featured above). You can check out our full review of the 6-quart Instant Pot Duo here. Who should buy this? Those who want to try out an Instant Pot, or those who want to purchase a second or third pot. Who’s it for? Anyone who wants to try a low-priced Instant Pot. Trying out an Instant Pot for the very first time? You might not want to invest a lot of money (or kitchen space, for that matter) on an appliance you have no experience with. Although the Instant Pot Lux is the baseline Instant Pot model, you can still cook just about anything in the Lux. It features six different functions: pressure cooker, slow cooker, rice cooker, saute, steamer, and warmer. There are also ten different built-in programs to help you cook specific foods, including soup/broth, multigrain, and meat/stew, so you can easily cook your favorite Instant Pot recipes with the press of a button. The 3rd generation microprocessor enables up to 240 minutes of pressure cooking, with up to 24-hour start delay, so you can program the machine ahead of time and come home to a ready-to-eat meal. The machine can also automatically keep food warm for several hours, so you can cook your food, binge Netflix, and still have warm and ready-to-eat food. The pressure cooker features 10 mechanisms to ensure users can handle the device safely, and the inner cooking pot is made of food-grade 304 stainless steel with no chemical coating. In addition to the 3-quart size, the Instant Pot Lux also comes in 6-quarts (retails for $80) and 8-quarts (for a retail price of $110). There’s a 5-quart version too, but it’s more difficult to find. You can also buy the 6-quart model in different colors and floral patterns. Who should buy this? Those who do a lot of cooking at home. Who’s it for? Families who want to shorten their nightly meal prep times. The Instant Pot Ultra electric pressure cooker covers just about anything you might want to do in the kitchen. It has a whopping ten functions: pressure cooker, slow cooker, rice/porridge cooker, yogurt maker, cake maker, egg cooker, saute/searing, steamer, warmer, and sterilizer. That means you can have just one appliance take the place of ten. It’s also easy to use, with a central dial that makes it easy to select different programs, adjust times, and more. This device also features an embedded microprocessor, which helps to monitor the pressure and temperature while adjusting the intensity accordingly, helping to ensure perfectly cooked food every time. Plus, the pressure cooker offers 11 safety features, including a new steam release reset button that makes it safer for users to handle the appliance. The mid-sized 6-quart size is perfect for a family of four, but you can also choose the 3-quart (retails for $120) or 8-quart (retails for $180) option. Who should buy this? Those who want a large Instant Pot with a lot of cooking functions and options. Who’s it for? Large families who like a variety of different foods. The Duo Plus carries the power of nine different kitchen appliances: pressure cooker, slow cooker, rice cooker, steamer, yogurt maker, egg cooker, sterilizer, and warmer. For a large family with different people who like different foods, this cooker is ideal because it’s extremely versatile. The egg-cooker function can create perfectly prepared eggs in just a couple minutes, while the sterilizing capability can effectively pasteurize milk and clean utensils. This pot is also great for making desserts, like cheesecake, cakes, and brownies. The embedded microprocessor constantly monitors the pressure, temperature, and intensity of the cooking process, evenly distributing heat to ensure a perfectly pressure-cooked and delicious creation every time. If you’re ever concerned about high pressure, you can use the quick release toggle on the top of the lid to release. However, if you’re just using this one-pot system for slow-cooking, there’s no need to worry. How is an Instant Pot different from a pressure cooker? Can you buy an Instant Pot with an air fryer? Where can I find Instant Pot recipes? What can’t I make in an Instant Pot? What are the best Instant Pot accessories? Does the Instant Pot offer ‘smart’ features? A pressure cooker can either be an electric device you plug into the wall, or it can be a stovetop cooker that uses the heat of your cooktop. A pressure cooker builds up steam pressure inside of an airtight pot to quickly cook foods. An Instant Pot is a multifunctional pressure cooker, meaning it has additional cooking functions outside of pressure cooking. Instant Pots are also slow cookers, sauté pots, warmers, steamers, and more (depending on the model). You may have heard stories in the past of exploding pressure cookers that resulted from a malfunctioning unit or from a random case of bad luck. Instant Pots have multiple built-in safety mechanisms such as lid closing and locking mechanisms, anti-blockage vents, automatic temperature controls, high temperature and burn warnings, pressure regulation and excess pressure protection mechanisms, and extreme temperature and power protection features. These safety features help to prevent accidental fires and other dangerous situations, and encountering a dangerous situation is pretty rare. There are several models of Instant Pots, and they offer a variety of different cooking functions. Currently, there’s not an Instant Pot brand multifunctional pressure cooker with an air frying function. However, Ninja’s Foodi does have a TenderCrisp function, and it is a pressure cooker, air fryer, steamer, and more. You can check out our full review of the Ninja Foodi here. Over the past few years, as Instant Pots have increased in popularity and so have Instant Pot recipes. Creative home cooks and chefs all over the place have published countless recipes online. You can find recipes for almost anything, from desserts to appetizers to easy weeknight dinners. We’ve found that some of the best online food blogs and websites for Instant Pot recipes are Amy + Jacky, All Recipes, and Genius Kitchen. You can make almost anything in an Instant Pot, but there are a few foods you shouldn’t cook in a pressure cooker. Foods with a breading, like chicken tenders, probably won’t turn out very well because the Instant Pot moistens rather than crisps. Some berries, like strawberries and blueberries can also be a nightmare, as they tend to sputter out of the top as the pressure releases. The best Instant Pot accessories are ones that will make your pot perform better, make your recipes come out better, and make cooking easier. A good steamer basket is extremely important. And, while the Instant Pot comes with a trivet or steaming rack, it’s a good idea to get a larger and better one. Why? For many recipes, like steamed veggies, most chicken recipes, eggs, and potatoes, you don’t want your ingredients touching the water at the bottom. It also helps to have a glass lid for your pot. This way, when you slow cook or sauté, you can see inside of the pot and still have it covered. A lot of people like to have baking accessories for their pot, like a good springform pan or cupcake liners that fit into their Instant Pot. This makes it so you can easily make recipes like cheesecake, brownies, and lava cakes. All models have a microprocessor that adjusts variables like temperature based on quantity of ingredients in the pot. Instant Pots also have features like 24-hour delay start times, and some models have an LCD display. But only one Instant Pot model — the Instant Pot Smart WiFi — actually connects to the internet. You can do things like control and monitor the IP Smart with your phone, receive alerts about the status of your meal, and the use the pre-programmed recipes in the Instant Pot App. 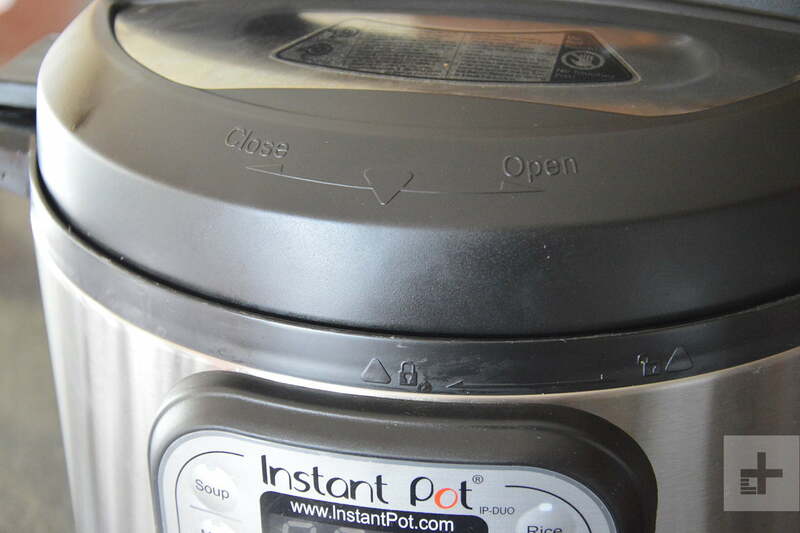 We conducted a review of the Instant Pot Smart, which you can check out here.